This is plate 13 from Charles Ramus Forrest's 'A Picturesque tour along the rivers Ganges and Jumna, in India'. Forrest was an East India Company official who made excursions along the rivers, producing drawings "attentively copied from nature, and in many instances coloured on the spot, ... while the magic effects of the scenes represented were still impressed on [his] mental vision". 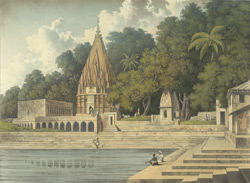 He wrote of this scene: "Exclusively of the grandeur of the appearance which the city of Benares exhibits as seen from the river, by walking round its environs a number of other objects, of great architectural beauty, are scattered ... interspersed with a variety of the richest foliage, offers views highly interesting and beautifully picturesque. There is one in particular which is highly valuable as a perfect specimen of the pure Hindoo style of temple," as scene in this plate.